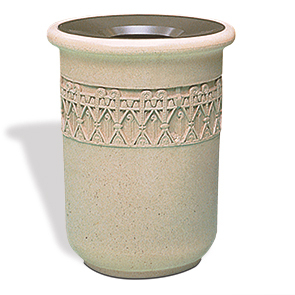 Add a splash of decorative excitement with a unique cast band on this 26 gallon receptacle. Made with ASTM compliant precast concrete and aluminum pitch-in lid offers the resiliency sought after and highly valued in commercial grade site amenities. Hands-Free pitch-in lid allows for sanitary disposal, conceals contents and minimizes odors as necessary. Security cable keeps the lid physically connected, proving most helpful when servicing. Concrete is steel rebar reinforced, with a variety of color options and finish styles it's easy to strike a balance with the installation's surrounding landscape.